October 9, 2012 Adri H.
"Blocking" in the fiber arts world, is usually a finishing step. 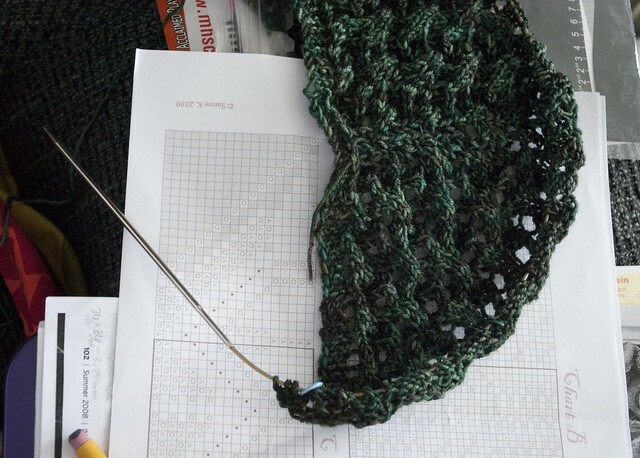 After your garment (or each piece) is knitted or crocheted, block to match the measurements given in your schematics, or you can seam them together and block them as a completed garment. The first step I take in this process is looking at the yarn band. I make sure I understand the care instructions for the yarn I'm about to block. 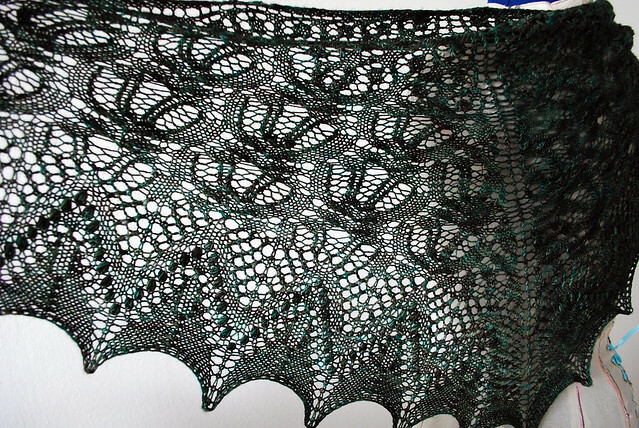 Then, I look at the pattern for any specific blocking instructions (lacy shawls often have areas that are accented in blocking). If you're worried about your yarn and want to avoid washing the garment, you can spray/mist it with water and proceed with blocking. The blanket shown above was made by a friend of mine, and she used a washable yarn. So, I went ahead and soaked before blocking. Usually it's a 20 minute soak (often longer because I forget about it). This lets the fibers relax into its new form. Then, I squeeze out the excess water. If I'm using strong yarn that can tolerate it, I'd place the gently wrung-out project in a lingerie bag and set it to the lowest spin cycle on my machine with a towel or other things that need wringing out. If the particular yarn is too fragile for the spin cycle, I use a fluffy towel and lay the piece as flat as possible on the towel, and roll it up. This makes a towel-garment sandwich "burrito". I then squish the towel to remove even more excess moisture. Once you've removed as much water as you can, bring out your blocking surface. A friend and I went "halfers" on some kid's foam puzzle mat like this, so that's what I use. Basically you need a stable surface that can take and hold pins in place. Some folks use a mattress, others just towels. I place a dry towel on the foam squares and place the item atop the towel. I take a blocking wire and kind of "sew" it through the edge of the blanket taking evenly spaced chunks and trying not to splice any yarn with the wires. Sand down the ends of your blocking wire if you continuously get snags. For hard edges like in this blanket, I used T-pins to secure the intersection between wires. This makes a nice crisp corner too. For something round like this curved earflap, I use flexible blocking wires and T-pins (Squishy Chullo Hat). before blocking the "Percy Shawl"
after blocking the "Percy Shawl"
And with this scalloped shawl, you can see the drastic difference before it was blocked and after... I used a combination of techniques with this one (T-pins and thread). If I had had blocking wires back then I would have used the stiff ones for the top edge to get a straighter line. Instead, I used what I had - thread running through the top edge and T-pins to stabilize the thread. Then, I used a boatload of T-pins for the scallops. I hope this tutorial gives you a general idea of the many options you have for blocking your hand-made goods. These techniques can also be used for pre-manufactured wooly goods, too!